- Display units: micro-Tesla and milli-Gauss. - Data hold (HOLD) and Maximum (MAX) hold functions. - Over load: LCD display “OL”. -This meter is applied to measuring electromagnetic fields of extremely low frequency(ELF) of 30 to 300Hz. 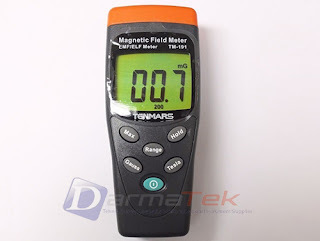 -It is capable of measuring the electromagnetic field radiation intensity that is produced from electric transmission equipment, power line, air conditioner, refrigerator, computer monitor, video/audio device and so forth.